A couple of months ago, I decided that my TV screen, a 55" Vizio E-Series flat screen, needed some maintenance. I play a lot of video games, and it was slightly unsettling to chase players down in Call of Duty: Black Ops 3 with these great swaths of dust littering my field of vision. Seriously, it was like watching a battle take place inside an Australian dust storm. When I had finally had enough (after watching my KDR drop to about .65 because I thought I was shooting enemy combatants, when I was really just nailing dust bunnies), I took it upon myself to grab a can of pledge and a paper towel and wipe my bad gameplay away. Now, I’m left with what appears to be permanent streaks across my television, giving the appearance that there are giant gray clouds in every scene. This doesn’t only affect my game play, it also gives my movie and television-based web surfing a dull sheen that wasn’t there before. I paid a lot for that TV—and my laziness in researching a proper way to clean it has resulted in a significant sadness in my day. Is there a dumb emoji? Something like a smiling yellow face with a giant question mark where its brain would be? Please make me a t-shirt of that and send it to me. Don’t use paper towels; also, avoid tissue paper, toilet paper (ewww) or old rags. These can scratch a screen or leave grooves in the material (maybe not enough for you to notice right away, but combined with the wrong cleaning material, it can create the aforementioned and dreaded gray swath). Try to use cloth made from the softest material possible (like micro fiber cloths). Also, cool that we just found out about it, these new detachable lens cloths by Tether Tools. You stick it on to a camera or laptop, then just peel it off and use the whole piece as the cleaning cloth. Neat. And you never have to look for those cleaning cloths again—you know the ones that you throw away when you greedily open your new electronic purchases? Yeah, those. If you don’t see the dirt lift right off, don’t think applying more pressure is going to wipe the slate clean. On LCD monitors, big screen TVs and laptops, putting more might into your cleaning efforts may result in irreparable damage—most likely by destroying the pixels in the screen. 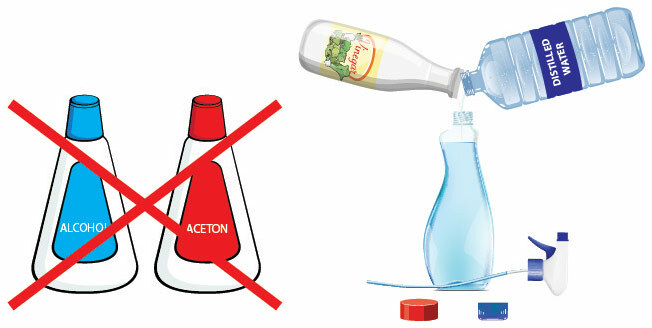 If you do decide to use a solution to clean the screen, here’s a list of things not to use: ammonia (like Windex, although Windex does make a cleaning solution specifically for LCD screens), ethyl alcohol, or anything with acetone or ethyl acetate—as a matter of fact, your best bet is a little distilled water and white vinegar mixed in equal amounts. The chemicals listed can adversely affect the coating used on LCD screens and flat-screen TVs. This one was tough to learn, and I learned the hard way. 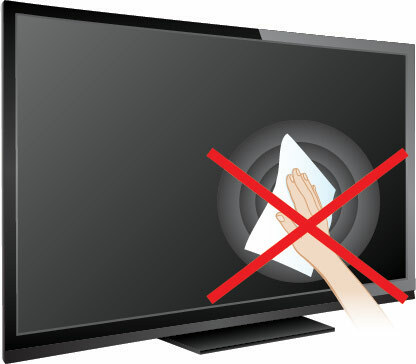 Cleaning solutions, even water, will run down the screen and into the bezels, giving them access to the inside of the monitor or TV. If you’re quick, you could catch it before it does further damage, but it’s a good practice to simply wet the cloth you are using and wipe the screen down instead of directly applying solvent or liquid. This is especially true (and dangerous) with laptop screens. There are two reasons for this: the first is that unplugged, you’ll be able to see more of the dust and dirt against the black background of the screen, and two, if you do use a liquid to clean, you want to reduce the chance of electrical shock. And there you have it—five quick tips that could save you thousands of dollars. 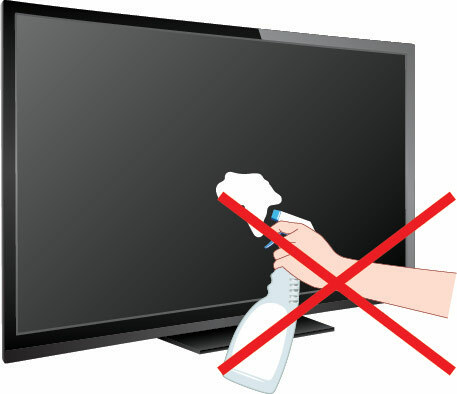 You put a lot of money into your TV; don’t be the dumb emoji and just spray it with chemicals, like me. Once you’ve got a clearer view of your world (and your screen), your wallet (not to mention your eyes) will thank you. My kids have used a pencil (!) on our flat-screen TV once or twice. Any recommendations for removing these scribbles? They aren't noticeable most of the time, but occasionally, they are annoying. Using a solvent to remove the scribbles is a risky business. You might try to use a very soft pencil eraser and very, very gently attempt to erase the pencil marks using a feather-like stroke. Proceed with caution as you do not want to damage the underlying pixel structure. Is it safe to use one of those anti-static dusters? I do not recommend anti-static dusters as they may leave a residue or leave fine scratches in the screen surface. Also - they tend to move around the dust as much as they actually remove it. I cannot endorse this practice because these used dryer sheets may retain a chemical residue and dust which would be transferred to your screen.